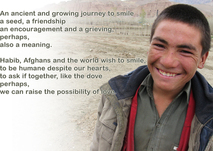 " Our Journey to Smile" is a blog site for the Afghan Youth Peace Volunteers, a group of youth in Afghanistan speaking out for an end to war. Click here to hear more of what they have to say to us. My dad and grand-dad were killed in the war and this morning I went to their graves to remember them. We the people of the world should restore the sacred value of life. We should revive true spirituality and recover our love. I grieve for every person killed in the Iraq war because that grief has also broken my heart. who contain dedicated bookish sham might plus receive pedantic honours, steps, or bestows revoked. This is heartbreaking, but I can see strength in this boy. Also praying for peace right now as I study here in my room.